You buy the game Titanfall 2 Ultimate Edition as a gift for Origin. The maximum edition of Titanfall ™ 2 is the best way to get acquainted with one of the most amazing shooters of 2016. This set includes not only all the content of the Exclusive digital edition, but also a set of "The key to start." He immediately unlocks all the classes of Titans and pilots, and also provides you with the means, tokens "Double Experience" and in addition special combat paint for the R-201 carbine. With such equipment, you will immediately settle on Frontier. 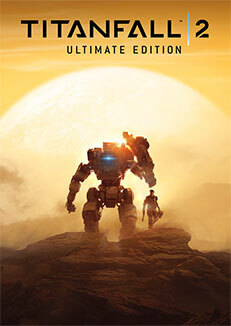 The maximum edition includes the main game Titanfall ™ 2, the content of the Exclusive Edition (Titans Prime "Scorch" and "Ion", drawings on the body of the Exclusive Edition for six Titans, exclusive camouflage for all Titans, pilots and weapons, the emblem of the Exclusive Edition) and the content " Key to Start "(unlocked all Titans and all tactical skills of pilots, 500 credits for unlocking equipment, decorative content and equipment, 10" Double experience "tokens and Underground car paint for R-201 carbine).